When planning a belly dance costume, it's important to make decisions about costuming for the feet at the same time as choosing the other elements of the ensemble. The wrong footwear will make the dancer look as though she doesn't enough care about her appearance to accessorize appropriately. Throughout this article, click on the photos to see the images in more detail. Sometimes, it helps to look at what dancers traditionally wore in the countries from which this dance comes. We can then make our decisions based on awareness of the facts, rather than on misconceptions. During the first half of the 20th century, the dance evolved into the art form we know today as raqs sharqi. Even in the early part of the century, dancers wore shoes. Modern-day dancers who justify barefoot dancing based on the belief that it is "traditional" are mistaken. Dancers in the Middle East did sometimes choose to dance barefoot, but footwear was certainly common. 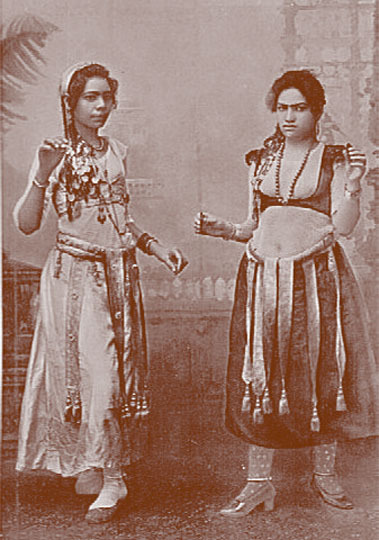 In the photo to the right, which was taken in Cairo in 1910, the dancer is wearing sturdy shoes, similar to those sold today by dance suppliers under the name of "character shoes". The 1920 photo to the right shows two Ghawazee dancers in Egypt. In this photo, as with the one above, the dancers are wearing shoes that resemble what we call "character shoes" today. 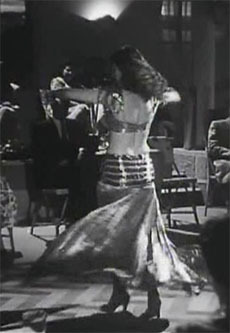 The photo to the right is a nightclub scene featuring a dance performance from the 1950 Egyptian motion picture Shatie el-Gharam (Shore of Love). The dancer, Tahia Carioca, can clearly be seen wearing European-style high-heeled shoes. These would be the equivalent of modern-day ballroom dance shoes. This scene from the 1949 Egyptian motion picture Afrita Hanem shows a close-up of Samia Gamal's feet. These sandals resemble the modern-day "Hermes" or "Roman" style of sandals sold by dancewear companies. Gamal's character is a genie, so the sandals are intended to represent what such a mythical character might wear. Although Golden Age Egyptian dance stars typically wore shoes to dance, they occasionally would perform barefoot. 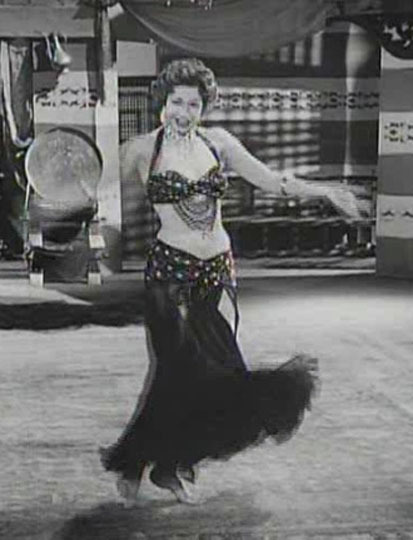 In this scene from the 1955 Egyptian movie Sigarah wa Kass, Samia Gamal's character is rehearsing barefoot in preparation for a comeback performance. In recent years in Egypt, it has become popular among top-name dancers such as Dina, Randa Kamel, and others to kick off their shoes near the beginning of their shows and perform barefoot throughout the remainder. It's common in Egypt today to see dancers wear shoes throughout their performances, but bare feet are also widely accepted as an option. It's a matter of dancer preference. 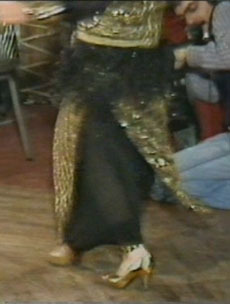 Lebanese audiences usually expect to see dancers wear high heels. Dancing barefoot would be considered low-class by many Lebanese clientele. In Lebanon, the standard footwear for dancers consists of high heels. This dates back to the era of Lebanon's legendary dancer, Nadia Gamal. Gamal's body type was petite, and therefore she wore high heels to appear larger on stage. When she soared to fame, other Lebanese dancers copied many aspects of her dance style and costuming, including her tendency to wear high heels. Today, decades after Gamal was at the height of her fame, high heels continue to be a prominent feature of Lebanese-style costuming for raqs sharqi. The image to the right is a still from the concert video Nadia Gamal: The Legend. Interestingly, Gamal is wearing high heels even with a folkloric-style costume. High heels are a very common costuming element among Turkish dancers. In this scene from the 1955 movie Son of Sinbad, the Turkish dancer Nejla Ates is wearing high heels. In July 2000, the prevailing footwear fashion among dancers in Turkey appeared to be platform shoes with high heels. The dancer in the photo to the right was performing in a nightclub in Kusadasi, Turkey. Although Egypt is the only Middle Eastern country where many Oriental-style dancers opt to perform barefoot, the concept of dancing shoeless is quite popular all over the world. In North America, it is much more common than dancing with shoes. It is also quite popular in Europe and Australia. Why Do So Many People Perform Barefoot? Barefoot dancing makes some people feel more grounded than wearing shoes. Many people think shoes are uncomfortable and wear them no more than necessary. Most people don't wear shoes for attending belly dance classes. Therefore, when they perform, they opt for bare feet to avoid becoming disoriented by the posture changes that shoes might create. Do Bare Feet Clash With a Sparkly Costume? Some people think a sparkly costume lavishly decorated with beads and sequins looks incomplete when worn without shoes. The thinking is, "You wouldn't go barefoot to the opening night at the opera or an elegant black tie party while wearing a sparkly evening gown, so why would you go barefoot when wearing a sparkly belly dance costume?" Compare the photo on the left (which has coordinating dressy shoes) with the barefoot photo on the right. You have attractive feet, free of blemishes. Your feet are clean and neatly pedicured, or perhaps decorated with either henna or tattoos. You know that the dance floor is free of broken glass, nails, splinters, and other potential hazards. You have spent enough time barefoot to build up healthy calluses on the soles of your feet. The dance floor contains hazards such as those listed below under "Risks of Dancing Barefoot". You are dancing for a Lebanese or Turkish audience that expects to see high heels. You like to use pumice stones to remove calluses from the soles of your feet, thereby removing your protection from hazards. Your feet are blemished with corns, calluses along the edges caused by ill-fitting shoes, or large bunions. The ball of your foot hurts after you dance barefoot on a hard surface, and you need cushioning. You need orthotics to support your feet. You have a history of knee trouble and don't want to risk injury from the torque that can occur when spinning barefoot. You are dancing in the style of Mahmoud Reda and Farida Fahmy, which involves many pivoting moves such as half-turns and Arabesques. Glass beads that fell off of costumes (yours or other people's) can burrow into the foot. A trip to the emergency room after performing is an expensive, unpleasant experience. In some Greek restaurants, people intentionally throw plates on the floor to break them. Usually, they use plates that were manufactured specially for this purpose and don't splinter, but the broken pieces of plate still pose a threat to a bare foot. A restaurant may have failed to clean up adequately after a waiter or a patron dropped something made of glass on the floor, and those glass splinters could become embedded in your foot. The bare foot may fail to pivot freely when doing spins, half-turns, Arabesques, and other pivoting-oriented moves. This can torque the knee, leading to knee injuries. Older wooden stages may be in poor condition and cause splinters to enter the feet. If you have a bunion, the pounding of your foot directly on the floor without cushioning can cause painful swelling at the joint where the second toe attaches to the metatarsil (foot bone). If you dance outdoors on a surface heated by the sun, such as concrete, metal, or marble, your feet can sustain painful burns, perhaps even bad enough to blister. Mahmoud Reda tells the story of how Farida Fahmy incurred painful burns on her feet after dancing barefoot outdoors in the blazing African sun. You could acquire a hygiene problem such as athlete's foot, warts, or other issues caused by direct contact with a surface that someone else deposited their viruses or funguses on. "Barefoot sandals" are a type of jewelry, often crocheted or made with beads, that fit across the top of the foot. They are typically attached with a strap that fits around the ankle, and another that fits around either the big toe or the second toe. However, these are not recommended if you do floor work, because the beads will press painfully into the top of your foot when you are kneeling. If you buy a set, take care to ensure that they are well-made. If they come apart while you are dancing, you can injure your foot by stepping on a rogue bead. Dancewear suppliers sell a number of products that provide the foot with a bit of protection against injury, while still preserving many of the benefits of dancing barefoot. Look for names such as "Dance Paws" or "Foot Undeez". Product lines are always changing, and new ones being introduced. To see currently-available options, explore the footwear sold for "modern dance" offered by your favorite dancewear supplier. 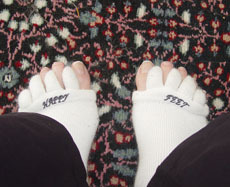 Modern dance is often performed either barefoot or while wearing barefoot-look footwear products. Some dancers opt to wear shoes to protect their feet from broken glass, sticky restaurant floors, splinters, and other hazards, but want the comfort of a barefoot look. 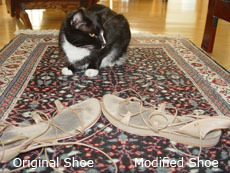 Several styles of flat-soled shoes are available to choose from. Oasis Dance Sandals. Made by Aruba's Oasis. The copper-colored sandal in the photo to the right was made by Aruba. Hers are my favorite dance sandal because they are more comfortable then the others mentioned below. They come in a variety of colors, including some metallic ones such as the copper one in the photo. Click on the photo to see it in more detail. Adagio Sandals. Made by Leo and sold by mainstream dance shops. I think these only come in tan. Hermes or Roman Sandal. Made by Danshuz and sold by mainstream dance shops. I think these only come in tan. PHOTO CREDIT: The photo of the copper-colored Oasis Dance Sandal by Aruba is by Pixie Vision Productions, Glendale, California. The photo of the silver Capezio Hermes sandal (which is no longer made/sold by Capezio) is by William M. Smith, Iowa City, Iowa. The style shown in the photo to the right is known as "ghillies", and is typically worn for Scottish Highland dancing and Irish dancing. These shoes work well for dancers who need to wear an orthotic device, as well as for dancers who want to cover their toes for some reason. These shoes come in tan and black. If other colors are desired, they can be painted using shoe paint. In the shoe shown in the photo, the laces have been removed and replaced with stretchy gold cord elastic of the type used for gift-wrapping, with the ends then knotted together. This prevents the problem of laces coming untied while dancing. It can be done with any type of lace-up shoe. If you prefer to perform in high heels, consider either character shoes or ballroom dance shoes, which come in many colors. Normal everyday fashion high heels are sometimes not very sturdy, and may break a heel under the stresses of dancing. Because ballroom dance shoes are designed especially for dance, they are less likely to give way under your fancy footwork. 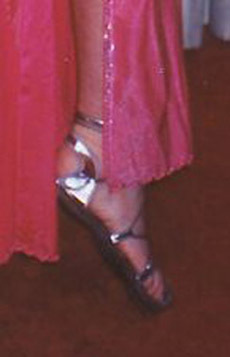 This photo shows low-heeled ballroom dance shoes, with only about a 1-inch (2.5 cm) heel. Ballroom dance shoes come in many glittery colors, and coordinate well with sparkly costumes. Dancers who prefer an earthy aesthetic (tribal-style or folkloric dance) may prefer character shoes. These are the shoes that most closely resemble the ones worn in the vintage photos from 1910 and 1920 that appear at the top of this article. They come in only a couple of colors, usually black and tan, though the tan ones can be painted using shoe paint. Even modest 1-inch (2.5 cm) heels change your posture and your center of balance. If you're planning to perform in heels, then you should attend all your classes and rehearsals wearing the exact shoes you intend to use for performing. Otherwise, the surprise of feeling your entire sense of balance change could weaken your show. The balls of the feet are very sore after dancing, especially in the area behind the second toe (the toe next to the big toe), which is marked in gray in the foot on the right side of this diagram. You may have a bunion. Check with a podiatrist to be sure. A bunion is a deformity of the foot involving the knuckle where the big toe attaches to the metatarsil (foot bone). There are several possible causes of bunions, including wearing pointed shoes with too-small toe boxes (even if they're flats). Your podiatrist can offer other suggestions such as surgery if the problem is severe and probably not caused by pointed shoes. Click on the above photo to see more detail. After dancing, if the joint behind the second toe is swollen and painful, massage arnica ointment into it. Remove the callus that forms behind the second toe as soon as it becomes large enough to press upward into the foot when you step on it. Either a pumice stone or a drill with a small ball attachment can help with this. When dancing, wear shoes with soft, cushioned soles. 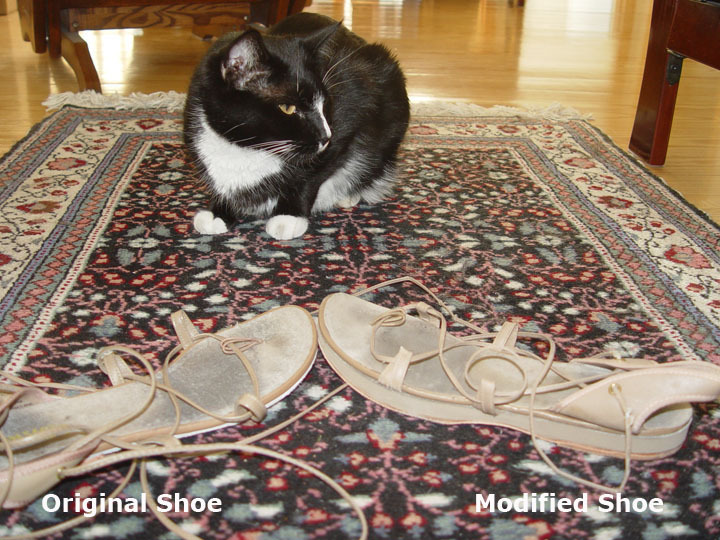 You can add a cushion to Hermes sandals and other dance shoes, as shown in the photo with the cat. (Click on the photo to see more detail.) The lift will cushion the ball of the foot and help prevent pain and swelling. Take the shoes to a shoe repair shop. Ask to have 1/2 inch (1 cm) lift added. Request that part of the lift be made from rubber or foam, and that the rest of it (the sole) be made of leather, to enable it to pivot freely. If your toes persist in remaining curled under like the second and third toes in the diagram to the right even when relaxed, you may have a problem known as hammertoe. Check with your podiatrist to be sure. Shoes with a toe box too small for the toes, causing the toes to curl in order to fit. Footwear isn't the only cause of hammer toes. If you are already wearing shoes that provide plenty of toe room and wrap around the heel properly, your hammer toes may have other causes. Consult your podiatrist for diagnosis and solutions. The toe is unable to straighten. Corns may form on top of the toe, at the knuckles. These are a build-up of skin, which can cause pain and look ugly. The toes may hurt when wearing shoes. Calluses may form on the bottom of the toe or on the ball of the foot. Eliminate all pointy-toed shoes and backless sandals from your closet. Wear high-heeled shoes only rarely. Ensure that all shoes in your wardrobe contain sufficient room for the toes to lie flat. Go shoeless as much as possible. If you get massages, ask your massage therapist to tug on each toe several times during each massage. Do foot exercises to encourage the toes to lie flat. Corns will go away on their own over time if the problem that caused them is solved. If you wear shoes to dance, choose only ones that have a section that wraps around the back of the heel. If the hammer toes have corns, consider performingn in dance shoes that cover the toe box such as ballet flats or ghillies to hide the unattractive corns. Some backaches following performances can be caused by standing around backstage and dancing in high-heeled shoes. These can cause the dancer's back to be thrust into a swayback position, which leads to back pain. High heels typically lead the person wearing them to thrust the chest forward and the buttocks back in order to balance on them. This posture, in turn, can lead to lower back pain. It takes training, practice, and experience to adjust one's high-heels posture to avoid these problems. Even a low heel, such as 1 inch (2.5 cm) can cause this. One option is to completely eliminate high heels from the wardrobe. Another option is to work with a highly-knowledgeable dance instructor to evaluate your posture while wearing high heels and make needed corrections. Then, practice, practice, practice in this corrected posture until it becomes automatic. Return to the instructor for follow-up evaluations to ensure the correct posture is being used. Avoid wearing shoes when standing around watching a show or waiting around back stage. Don't put the shoes on until just before the dancer ahead of you is performing. Remove them immediately after performing. If the back pain occurs anyway, it may be caused by something other than the shoes. Consult a qualified health care professional for assistance. After you have attended a class or workshop, or after you have done a performance, or after you have practiced at home, one or both of your knees hurt. They never hurt otherwise, only after dancing. One possible cause of this can be that your feet are failing to pivot freely on the floor when you spins, half-turns, Arabesques, and other pivot-oriented moves. (There can be other possible causes, such as problems with your dance technique.) It happens only after dancing, not after normal walking in daily life. If you usually dance barefoot, try wearing either socks or dance shoes that have smooth soles allowing your foot to pivot freely. If you usually dance wearing shoes with rubber soles such as jazz sneakers or ballet flats, replace those with shoes that have a slick, smooth surface on the sole. Use leather soles, not rubber. If you usually dance on carpet, concrete, or other rough surfaces that "grip" the foot, try wearing dance shoes with slick soles. If this doesn't solve it, find a different place to dance. Wear a knee brace under your costume to support your knee. Change your dance style to eliminate all pivot-oriented moves. Ask a highly-skilled dance instructor to evaluate your dance technique to determine whether there are any issues with the way you dance that could be causing the problem. Immediately after dancing, when the knee first starts to feel sore, place ice on it to control swelling. Continue icing for 24 hours, and avoid further dancing until after the pain has stopped. Dear Shira: I Want to Dance Barefoot! A dancer whose audience questioned her about her bare feet asks about it. Footwear Tips & Tricks. Tips for dancing barefoot and using dance shoes.